Giveaway - $25 Visa Gift Card & Ricola Prize Pack (Ends 2/1)! Giveaway – $25 Visa Gift Card & Ricola Prize Pack (Ends 2/1)! Wintertime is when most people use up their sick days thanks to colds and the flu. Yuck! Ricola wants to remind everyone of everything you can do to feel your best this time of year so that you can enjoy everything winter has to offer! What do you do to stay healthy this time of year? We are big on washing hands, covering our mouths when we cough and staying away from people when they’re sick. We also have quite the stash of medicines in our kitchen in case one of us does get ill! 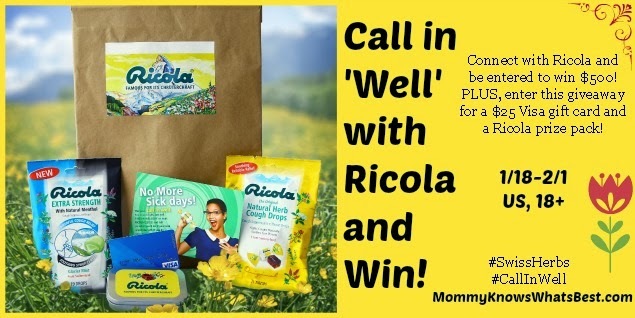 Ricola wants to you to call in well instead of calling off sick! 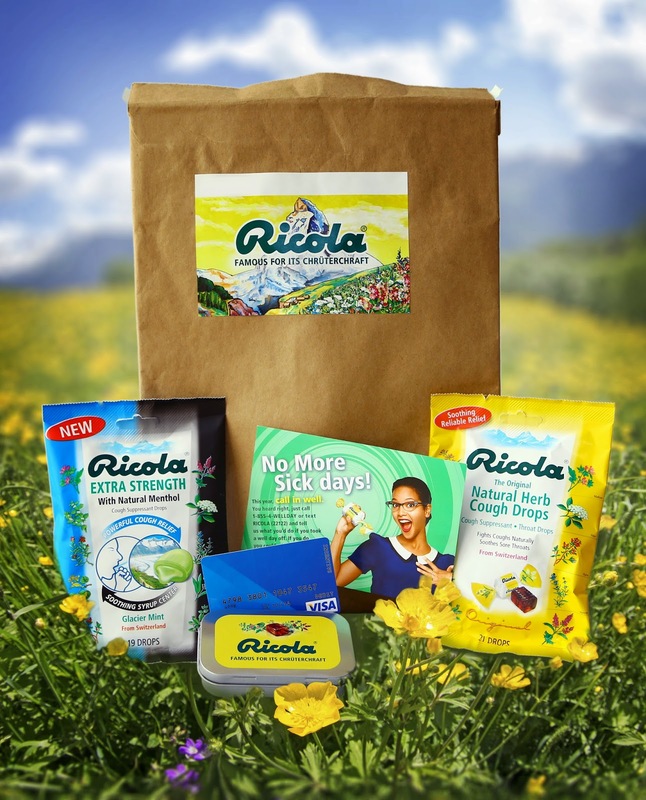 Thanks to Ricola, one lucky winner is also going to receive a $25 Visa gift card and a Ricola Prize Pack! Don’t forget about all of your daily entries! Disclaimer: Mommy Knows What’s Best is responsible for prize delivery. One entrant/email per household. One winner will be chosen randomly from Giveaway Tools. Void where prohibited. The winner has 48 hours to respond to the congratulatory email. If the winner does not respond, a new winner will be randomly chosen by Giveaway Tools. Facebook, Twitter, Pinterest, and Instagram are in no way affiliated with this giveaway. If you have any questions, please email Marissa at MommyKnowsWhatsBest@gmail.com. Enter to win using the Giveaway Tools Widget below! Next PostGiveaway – Pictures on Gold Locket (Ends 2/3)! Previous PostGiveaway – Amber for Babies Necklace (Ends 1/26)! I would go shopping and stop for some fro yo. If I called in well I would spend time with my family out side and doing fun things. I’d really like to learn bungee jumping. Thanks! I would go to the b each if the weather was nice. If the weather is cold or rainy I would stay home and watch movies. thank you. I rely enjoy this product itreally works great. If I called in well I would spend the day with my boyfriend going out to eat and maybe a movie! I’d just curl up with a good book, a cup of tea, and relax! I may just stay in bed all day and be lazy!! Fun for me would be relax and read. I would get a massage and read a good book. i’d go to the Y for a swim sauna and whirlpool. Top it off with my favorite Starbucks drink. I would be out the door. I would want to do things I normally wouldnt do. Hang with the family out in nature doing something fun. We’d go to the zoo or spend the day at the children’s museum. i would sleep in and read a book in one sitting. Sleep in and read all day!